A few shots of some of our native species - unsurprisingly since they are my greatest interest the Lizards predominate in this gallery. Common or Viviparous Lizard (Lacerta vivipara). Occasionally a green Common Lizard can be found leading to it being mis-identified as a Sand lizard. Comparison of this green male with the pictures of Sand Lizards will show they are very different. Common or Viviparous Lizard (Zootoca vivipara). This is a fairly typical adult male. The beauty of these little characters is greatly underestimated. Common or Viviparous Lizard (Zootoca vivipara. Juveniles Common Lizards such as this can seem almost black from a distance. A closer view shows much more variation of colour and markings. Grass Snake (Natrix natrix. Our largest snake which can exceptionally exceed 5 feet in length although 3 feet is more typical. This is a youngster, less than 2 feet long, who has been living in our garden since shortly after he hatched. Sand Lizard (Lacerta agilis) This is a juvenile of Dorset origin. Sand Lizard (Lacerta agilis). In this case we have a Dorset female. Sand Lizard (Lacerta agilis). This is a fairly typical Merseyside male. They are generally distinguishable from the two southern races by the paler colour and broad pale stripes. Not foolproof - ALL UK Sand lizards are of the same genotype. Sand Lizard (Lacerta agilis). This is a Merseyside female. Sand Lizard (Lacerta agilis). This is a Merseyside hatchling literally newly emerged from its egg. Sand Lizard (Lacerta agilis). This is a pair of Merseyside lizards. Although the female exhibits broad stripes neither would look out of place in Dorset. The racial differences are highly prevalent trends but are NOT absolutes. Sand Lizard (Lacerta agilis). This is also a male but in this case is a typical Dorset animal. 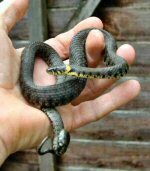 Note the darker colours and relatively thin dorsal stripes. Slowworm (Anguis fragilis). Another live-bearing but legless lizard the slowworm, as a slug eater, is the gardener's friend. Some males exhibit blue spots as can be seen here. Slowworm (Anguis fragilis). This is a juvenile - born, literally, hours before this photograph. Their beautiful silver, gold or bronze colouration makes them look like living jewellery. Slowworm (Anguis fragilis). This is an adult female. Females differ notably from males as can be seen. You will also see that she has lost part of her tail which has barely started re-growing.